The previous post Prehistoric revelations of a Manawatu flood made me curious about other signs of moa habitation in the Manawatu area. I came across an intriguing article in a 1908 newspaper which reports on a find of moa bones in Kimbolton, and the controversy the find created. The question it raises is, were moa still roaming the densely forested hinterlands of the North Island even as Europeans were first arriving on these shores? While tempting to dismiss Mr Bryce’s assertions as a crackpot theory dreamed up by an enthusiastic but amateur archaeologist, his hypothesis in fact attracted support from authoritative quarters. The well-respected engineer and surveyor Mr H. C. Field (1825 – 1912, who had himself presented papers to the Philosophical Society on the discovery of moa bones in the late 1800s), weighed into the debate, providing the names of a number of old Maori chiefs of Wanganui and Waitotara (south Taranaki) who told him in the early 1850s that they had hunted the moa up to about 1820-30. They described the moa as living in the skirts of the forests, and fighting with each other by striking forward with their feet. An interpreter, Mr G. Rees, also told Mr Feild that in about 1830 that the chief Te Teu Heu [sic – probably Te Heu Heu] had a moa cooked at a feast at his pa near Tokaanu (on the southern shores of Lake Taupo), and a Maori who was at the feast described the skin as being as large as that of a bullock. In the Manawatu, permanent Maori settlements in pre-European times were almost exclusively near the coast and along rivers. The dense inland forests were rarely ventured into; cultivations and bird-trapping were predominantly done on the periphery of forests. 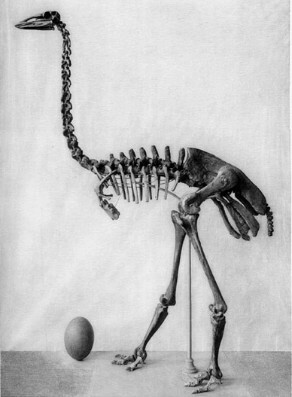 So it is certainly not unthinkable that some moa survived into the 1800s. Though the date – or even period – of their extinction in the Manawatu, or elsewhere in the North Island, may never be established with any certainty, it is certainly still a question that captures the imagination. Sources: Evening Post, Volume LXXVI, Issue 24, 28 July 1908; Marlborough Express, Volume XLII, Issue 236, 5 October 1908. Great post! Down here in the South Island there are a few stories of sightings by early settlers. It is hard to know what to take seriously but one likes to think there is some truth to them. Fascinating to hear similar stories from the North Island as well. If “The dense inland forests were rarely ventured into” by humans, what else would there be to kill off the moa in such habitats? Their continued existence at that time does not seem impossible. David Attenborough in his documentary at London’s museum of Natural History went into great detail about the Moa. While he described it’s main predator the Haast eagle, he made no mention of the Maoris arrival circa 1400 or of their overhunting that led to it going extinct within the next two hundred years. Later he describes the Dodo, a flightless extinct bird whose last confirmed sighting was circa 1690. Now my problem is this – why did he describe the Dodo as being the first bird forced into extinction by modern humans, when clearly this is not the case and why did he not mention the arrival of the Maori in NZ as the main contributing factor leading to the Moa’s extinction?